Greetings & Salutations! Well summer is coming to a close, hopefully everyone enjoyed the Labor Day Weekend! Ready for fall! Once again the leaves are falling...Be a kid again as you rake, jump into a pile of leaves! The Meeting Is Wednesday, September 21, 2016!!! Wednesday, September 21th, 2016 at 6 p.m.
September beckons Autumn and cooler temperatures! I hope everyone has enjoyed summer and Labor Day! I'm excited for scenic drives with yellow, orange and red leaves on the trees and fallen on the ground! Be sure to enjoy the Autumn events, festivals, concerts and all Portland has to offer! Topics for next month may be added before October 5th. 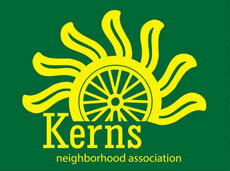 Please contact kernsna@gmail.com if you'd like to request time on the agenda. Kerns is Central Eastside and a key integral part for travel by foot, bike and transit to Downtown Portland, West End, Goose Hollow and China Town/Old Town. The Central City Multimodal Project is designed to help make getting to and around the Central City safer, easier, and more convenient by foot, bike, and transit. There is an online survey asking for input to help PBOT learn how people travel around the Central City and ways we can improve it. There is an incentive: You could win one: One-Month TriMet pass $100 of SmartPark credit A one-year Biketown membership! Sellwood-Milwaukie Sunday Parkways October 2, 2016 ~ 11 am - 4 pm (8 miles). Tour Sellwood-Milwaukie. Last event of the season! This new route will include Westmoreland, Sellwood, and Water Tower Parks plus the Milwaukie Farmers Market and the Milwaukie Business District. Have a bite to eat, listen to tunes, and join some activities. Council Work Sessions Tuesday, September 13, 9:30-10:30 a.m. Thursday, September 15, 2-4 p.m. Tuesday, September 20, 9:30-10:30 a.m. Tuesday, October 25, 9 a.m. -12 p.m. Tuesday, November 22, 9 a.m. -1:30 p.m.
Tell City Council What You Think! Portlanders can testify on any element of the Early Implementation Package to City Council through the Map App, by email or letter, or in person at a public hearing! New zoning proposals for mixed use areas, campuses and institutions, employment land and residential neighborhoods were released last week for consideration by City Council and the public before Council holds public hearings in October. Learn more about how these proposed changes may affect your property, stop by one of the following events and chat with a City planner. There will be no formal presentation, but staff will be available to answer questions about proposed changes. While not necessary, bringing the notice will help staff better address your questions and concerns.